When Frank Sinatra said “Come Fly With Me” I doubt he took into consideration the sheer variety of limitations we would have to face in the 21st century. 100ml or less on all liquids, baggage costing extra and hand luggage below a certain size, it’s something of a small miracle to actually be able to go abroad and maintain an element of style. Having recently been on a trip of my own to Rome, I managed to research a few tips for fashionable travelling which will help give make your holiday a Voyage of Vogue, rather than a Passage of Primark. Smaller liquid limits on toiletries doesn’t necessarily mean you have to buy the overpriced miniatures at the airport Boots. In fact, there are a variety of companies out there who offer small travel packs of your favourite grooming collections designed for air travel. I’ve reviewed a few, including the Anthony Logistics travel kit which is a great middle-of-the-road pack for any traveller, whether business or pleasure. Cologne and aftershave bottles are often beautifully designed, but rarely make for easy packing when you’re trying to fit in a week’s worth of toiletries and clothes. There are a couple of ways to get around this and ensure you can carry your favourite scents without losing vital packing space. Firstly, check whether your favourite fragrances don’t come in travel sizes. Most suppliers provide 30ml bottles of their designs that will easily last you a month, when used sparingly, so check before you fly. Alternatively, invest in a travel atomizer that will allow you to feed some of your cologne into a small bottle that is easily packed and takes up minimal space. These usually cost £10 or upwards so you should be able to find one that suits you fairly easily regardless of your budget. Finally, a new tactic being employed by some fragrance producers is to create a line specifically designed for travelling. One such example I’ve recently got my hands on is the travel tonics from Ted Baker, styled for easy packing and with an individual character in mind, they are the next step in male grooming on-the-go. The ultra-slim, steel bottle is shaped like a mini hip flask and fits easily within a blazer pocket or in a wash bag. The silver (Ag) is a wonderfully mature men’s fragrance, with notes of bergamot, heather and cedarwood that offer a long-lasting, classic scent that would be appropriate in any climate and for any occasion. It’s a new essential in my regular travel kit and has freed up important space in my bag. They are also available in Gold (Au) and Copper (Cu), each offering a different fragrance to fit your travelling persona. How do you pack a bag? I’m fairly sure no matter how you answer, there are several ways to improve it with minimal effort. Need to fold a shirt so that it doesn’t get creased on a journey? There’s a hack for that. 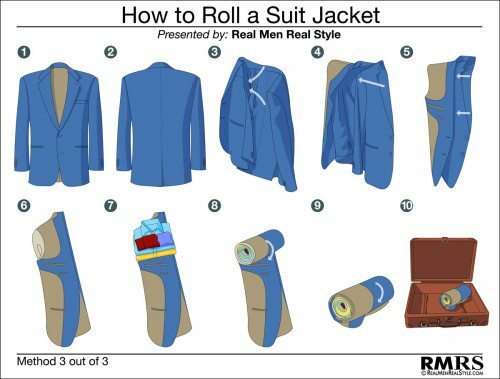 Need to pack a suit jacket but don’t have a carry case? There’s a way to pack it. This one’s a simple one. If you use a brush at home, swap it for a comb when you travel. Less space and just as useful. Thanks for checking out the post and make sure to let me know if you have any questions or feedback, you can also leave your own personal tips on how travel stylishly. You can also sign-up to be notified of new posts and follow The Male Stylist activity. Also, don’t forget to follow me on Twitter or Instagram for style inspiration, gentleman’s musings and general fun.